How would you like to know the secret to linking up with the blessing, miracles, signs and wonders of the Kingdom of God? 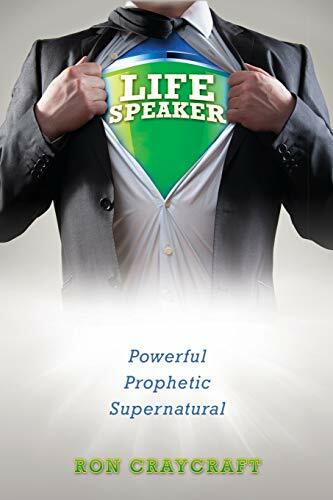 "Life Speaker," will guide you through God's plan for connecting and activating His power in the earth. "Fasten your spiritual seat-belt," because "Life Speaker" is all about leading you into God's supernatural ways.If you haven't witnessed miraculous manifestations of the Spirit of God in your own life -- get ready - you soon will because they are happening around the globe and they are on the increase. There's one major thing that has kept believers from a continuous flow of miracles and healings. Words! That's right, your own words can put you into position for a victorious, abundant life in Christ. Or, your own words can block your prayers and "stop" the flow of God's power and blessing in your life. This is the way God's spiritual laws operate. It's the law of His Kingdom. It's not about the 10 Commandments kind of law, it's about spiritual laws of the Kingdom of God that operate on earth as sure as gravity and electricity. RON CRAYCRAFT is founder and senior pastor of Forecast For Life Church. God has blessed him in his own personal life in many ways. Ron's life mission is to help others live an abundant life in Christ, by growing stronger in faith and being Holy Spirit filled. Address: King of prussia, PA, U.S.A.